Prior to the passage of legislation in 2015, the state could recover only assets from a probate estate to settle a Medicaid debt. That bill adopted the federal definition of an estate to include additional assets in an attempt to combat the hiding of assets. Senators advanced a bill from general file April 19 that would provide guidance on implementing the expanded asset recovery program. Introduced by Columbus Sen. Paul Schumacher, LB268 specifically itemizes which assets would be eligible for recovery by the state Department of Health and Human Services (DHHS). Schumacher said the bill would provide clarity and address ethical dilemmas faced by estate planners when asked to hide their clients’ assets. Under the bill, a person applying for Medicaid assistance would be required to disclose all interest in real estate, trusts, corporations, limited liability corporations or other entities, as well as any income derived from them. Failure to disclose such interests would result in any received assistance being declared illegally obtained and subject to recovery by the state. If an applicant for assistance retains an interest in an asset that has been transferred to a relative for less than a commercially reasonable price, the income derived from the asset transfer also would be subject to recovery. DHHS could bring an action to recover unlawfully obtained medical assistance against the estate of a Medicaid recipient within five years after his or her death and that of any remaining spouse. LB268 would define a recipient’s estate as any real estate, personal property or other asset in which the recipient had any legal title or interest at or immediately prior to the time of the recipient’s death, including insurance policies and annuities in which the recipient had an interest. 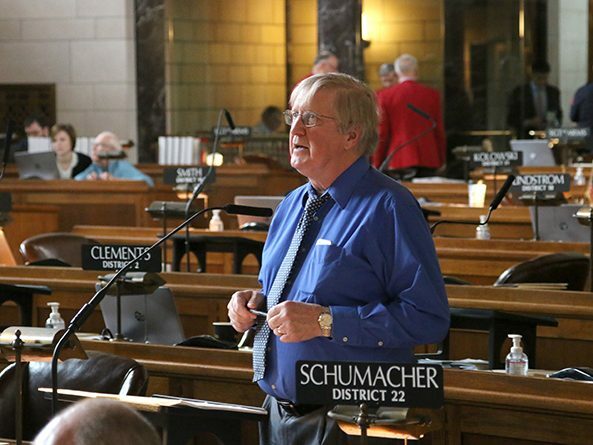 Gothenburg Sen. Matt Williams supported the bill, saying recovery of assets has been a difficult issue facing Nebraska for years. Estate planners often are asked to place their clients’ personal interest above professional ethics. A Judiciary Committee amendment adopted 29-0, clarified that assets eligible for recovery under the bill would include securities, bank accounts, intellectual property rights, contractual or lease rights and other similar types of assets. The amendment also provides a mechanism to appeal any DHHS decision as to whether a transfer of assets is commercially reasonable.